Tag Archives: Who Runs The World? For aeronautical student River, it’s a day like any other. She’s been out in the woods, collecting cider apples, and is now on her way home without a care in the world. But then she encounters a stranger who is seriously unwell. More worryingly, that person is an XY, a male, and River has never in her life met one before. 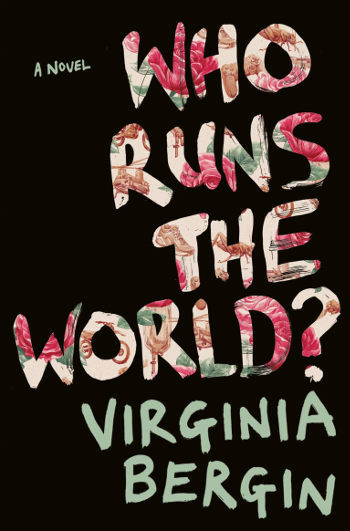 In Virginia Bergin’s third YA novel, Who Runs The World?, we enter a reality set sideways from our own thanks to one significant difference. Sixty years earlier, a virus wiped out the majority of men on the planet, and now all male babies are taken away to live in sanctuaries, safe from the illness that would kill them, but which leaves the females untouched. River has grown up in a society ruled by women, where concern for the planet comes first, and concern for community second. Concern for self is barely worth mentioning, as empathy and Courtesy (awarded a capital letter throughout) are the only accepted behaviours. It’s an outlook newcomer Mason is set to challenge. If TV series The Handmaid’s Tale introduced a new generation of women to Margaret Atwood’s warning, Who Runs the World? kicks us into assessing our own auto-responses to what we think of male and female and the space in between. In many ways, the sans-XY world she has created reads like a utopia, but seen through an adolescent’s eyes, there’s a level of naivety and ignorance that allows for credibility to shift and crack. The darkness of the sanctuaries and the realisation that secrets are being kept at higher levels of society knocks River’s certainty about the world she inhabits. It’s a process we all go through as we get older, but set against a re-imagined world, it’s heightened in a way that’s wonderfully thought-provoking. It’s no wonder that when her first encounter with a male doesn’t go well, she can only assume the ideas she’s picked up on are correct. “Every strange and scary thing I’ve ever heard said about XYs comes bursting into my head.” Mason is terrified, and therefore threatening, in a way River has never experienced from any person previously. With her mother Zoe-River equally alarmed by the creature’s arrival in their lives, it takes River’s great-grandmother Kate to point out that Mason isn’t an It or a man, but a boy, and that he has far more reason to be afraid than they do. This is just the beginning of River’s reawakening, and as she twists and turns through the story, re-examining what she has been brought up to believe, it’s inevitable that we readers do a semblance of the same. “I can’t find a place in my head where that fits,” she says near the beginning, but by the end of the novel, a new space has grown and her mind is more open, and wiser than ever. Throughout, River has questioned what she holds to be true, and we’re prompted to ask questions too, about right and wrong, gender norms and the society we’ve been shaped by, at least to some extent. Vigorous, energetic and exhilarating, this is a novel that has heart and courage, just as its protagonist River does. A refreshing fiction with a core of truth, which should be compulsory reading for all age groups and genders. Who Runs The World? by Virginia Bergin is published by Macmillan Children’s Books and available to buy from Amazon. Read Virginia’s insights into writing YA fiction. What are you reading? I’d love to know. I’m always happy to receive reviews of books, art, theatre and film. To submit or suggest a review, please send an email to Judy(at)socketcreative.com.